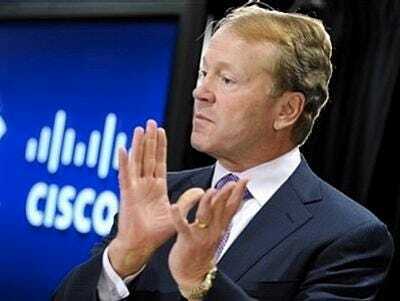 Cisco’s plan to rule the Internet will be unveiled next week during a press event on March 9. What is it? Most reports we’ve seen so far suggest it will have something to do with a super high-speed Internet initiative with broadband companies, some sort of content distribution network, and some sort of consumer-focused “telepresence” — fancy videoconferencing — system. Sound confusing? That’s because it is confusing. It’s hard to know exactly what to think until everything has been announced — with all the details in place — but it sounds like Cisco is going to try to make the huge leap from enterprise equipment provider to consumer equipment provider. It’s been inching that way with Linksys over the years, and more recently with its Flip camera acquisition. Selling stuff to consumers is obviously sexier than selling set-top boxes to cable companies, and it could potentially represent a huge new gadget-and-service revenue stream for Cisco. That is, only if Cisco can create a new market that barely exists today — the consumer-purchased set-top box. And it’s not going to be easy. Companies like Apple, which have a much stronger legacy of creating useful consumer devices, have been trying to disrupt the cable and satellite companies in the living room for a few years, with mostly wimpy products and little success. Cisco’s success will depend on a lot of factors, including device quality, pricing (those set-top boxes don’t come cheap), marketing, content ecosystem, etc. The best case scenario is that Cisco unveils one box that is inexpensive and can play every Internet video known to man, AND maybe some sort of digital cable, too. And maybe be an awesome Web or app device. It’s not a ridiculous idea to conclude that the cable companies are slowing Cisco down, and that it could do much better by working around them. But it’s a long shot. People are in no rush to install these devices in their living rooms, because none of them have any killer features. If anything, the successful Web-video-in-the-living-room products so far have just been video game consoles that people are using to watch Netflix on. We’re excited to see what Cisco is working on, but with what little detail we’ve seen so far, it’s hard to predict whether this will have any impact on the industry or just be more noise.